Address: Chalana, 7, Puerto del Carmen (Lanzarote), Islas Canarias. The adults-only San Francisco Park is located just 200 metres from the beach in Lanzarote’s Puerto del Carmen resort. It offers an outdoor pool and studio apartments with a private balcony. The San Francisco complex has spacious, open-plan studios, featuring a kitchen with a hob and kettle and a private bathroom. Staff at reception can provide information about what to see and do in Lanzarote. There is a bus stop 100 metres from the hotel, connecting you with the rest of the island. San Francisco is just 1 minutes’ walk from Puerto del Carmen’s main promenade, where you can find a range of shops, bars and restaurants. 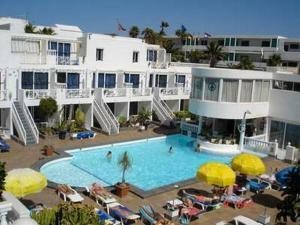 Lanzarote Airport is 10 minutes’ drive from the San Francisco Park Apartments. Please inform San Francisco Park in advance of your expected arrival time. You can use the Special Requests box when booking, or contact the property directly with the contact details provided in your confirmation. Please note that this complex does not accept children under the age of 16. Guests should indicate their anticipated time of arrival by contacting the property and informing them of their flight details. Contact details for the complex appear on the Booking Confirmation issued by this site The hotel does not accept American Express as a method of payment.